I have some rules about pancakes. I can only eat them if 1) I have run at least ten miles that day, 2) my dad makes them (his secret brown rice recipe) or 3) I am camping. However, today after pleading from the monsters, I made an exception. I had just run 6 miles…so I justified that I could make healthy pancakes–like these Oatmeal Pancakes–you know whole grains, lots of fiber. But just reading the recipe made me tired-I just didn’t have the energy to grind oats and make a separate pot of oatmeal. Maybe next time. 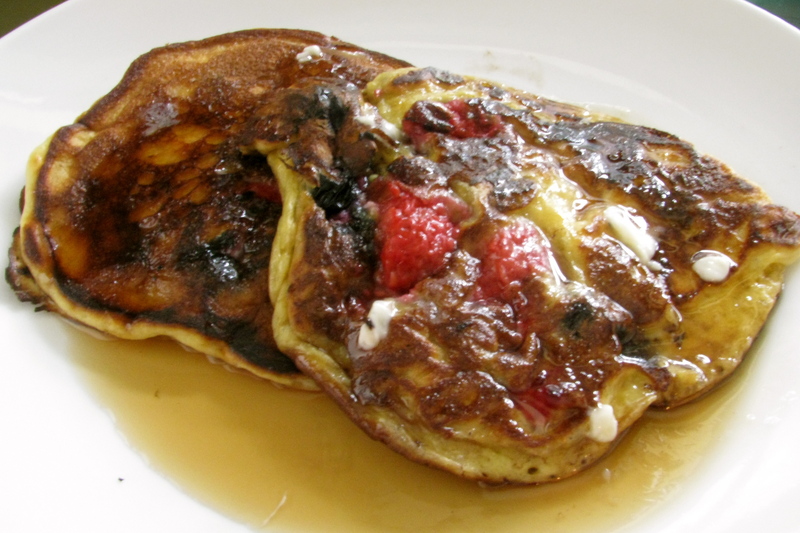 Then I came across this recipe for Edna Mae’s Sour Cream Pancakes…..I had heard of it before and knew that it was one of the most praised recipe from Pioneer Woman’s cookbook. That got me intrigued. Even more intriguing was the recipe….so little flour, so much sour cream. How in the world could this combination turn into pancakes? 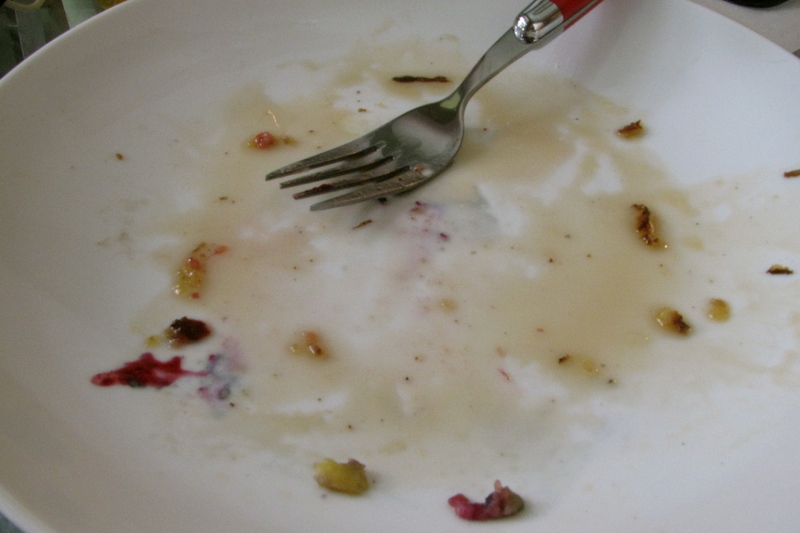 I had sour cream (thanks to the two for one sale) and I had raspberries-one of my favorite pancake ingredients—I was sold. We were gonna have Raspberry Sour Cream Pancakes for Sunday morning breakfast! You should too….they were very easy to make and very easy to eat too. 1) Heat a nice big pan (like a cast iron griddle) over medium high heat. You want it to get nice and hot and it worked well to get it hot as I was mixing up the ingredients. 2) In a big bowl, add 7 T. flour, 1 T sugar, 1 tsp baking soda, and 1/2 tsp of salt. 3) Add 1 cup of sour cream. Mix the dry ingredients with the sour cream until combined but do not overmix. 4) In a separate bowl, whisk together 2 eggs and 1/2 tsp vanilla. 5) Add the egg mixture to the sour cream mixture and mix well (using a wooden spoon). 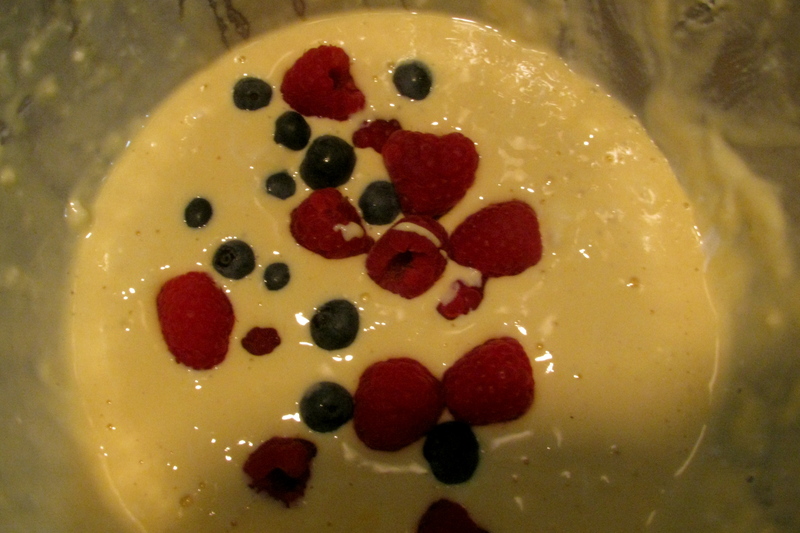 6) Add about 1/2 cup of raspberries (or a raspberry blueberry combination). Lightly fold them in to the batter—you want to be careful to not crush the berries. 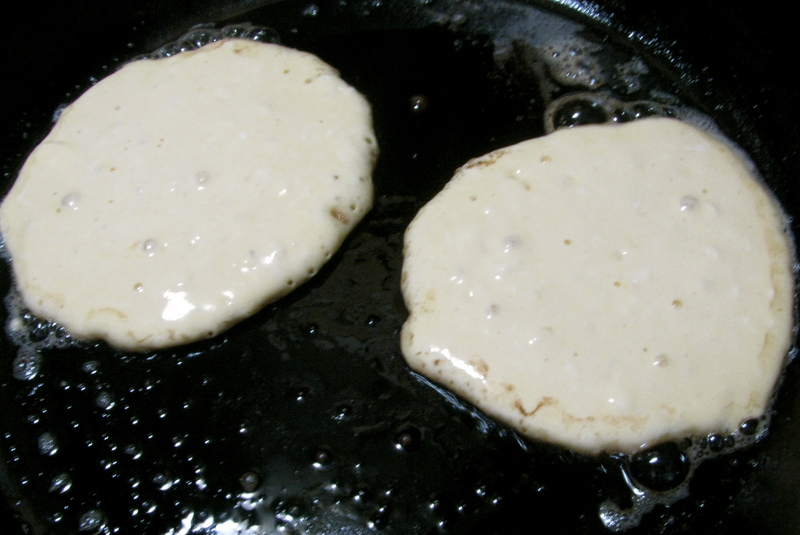 7) Melt 1 T of butter in the hot pan and add 1/4 cup of pancake batter to the pan. 8) Once the cakes have some bubbles on them, flip ’em. 9) Cover them with maple syrup (only the real stuff will do)…. and devour!